Winning Powerball Tickets Sold In Arizona And Missouri; Who Bought Them? : The Two-Way Whoever bought the winning tickets will be splitting a $580 million jackpot, the second-largest in U.S. lottery history. Now, the wait is on to see who steps forward. Ticket sales soared as the jackpot grew. After all the hype and hoopla, millions of Americans (including us) are waking up this morning to learn that they aren't sudden millionaires. 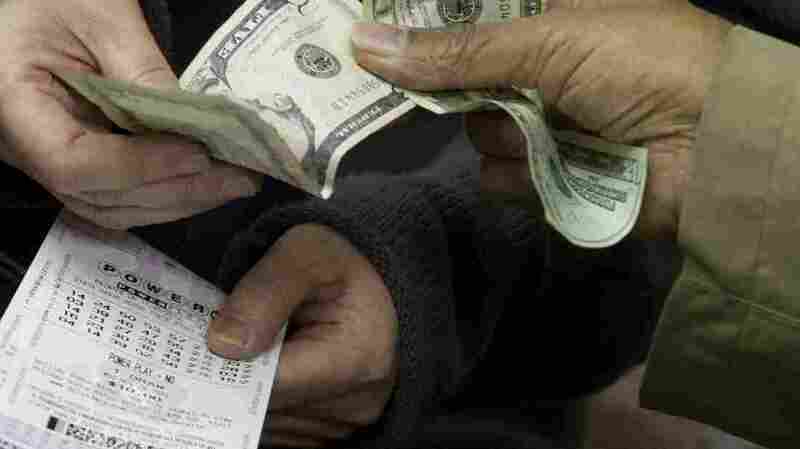 Yes, there were winning tickets sold for Wednesday night's $580 million Powerball jackpot. But there were only two tickets that correctly matched the numbers drawn: 5, 16, 22, 23, 29 and Powerball of 6. The winners were sold in Arizona and Missouri. Now, the wait begins to see who steps forward with the winning tickets. Interestingly, just yesterday our friends at St. Louis Public Radio reported that Missouri already had "the second-most number of Powerball winners just behind Indiana." The odds, though, favor no one particular state, they added. Wednesday's jackpot was the largest in Powerball history, and the second-largest in U.S. lottery history (to a $656 million Mega Millions jackpot in March). The "cash option" means the winners will be splitting about $380 million (before taxes). Of course, if the tickets were sold to groups that had pooled money, then each individual in those groups will be getting a share. In happier news, we do not have any reports of anyone being crushed to death by a vending machine.